In a bid to help young farmers work more safely on All Terrain Vehicles (ATVs) Honda is offering a free training course to the 25,000 members of the National Federation of Young Farmers’ Clubs (NFYFC) across England and Wales. The new training session was announced on Tuesday 25 July during Farm Safety Week at the Royal Welsh Show. The courses will offer potentially life-saving advice to young farmers – a necessity when the latest HSE statistics, released this week, show agriculture has the poorest fatal injury rate of any other industry in Great Britain. 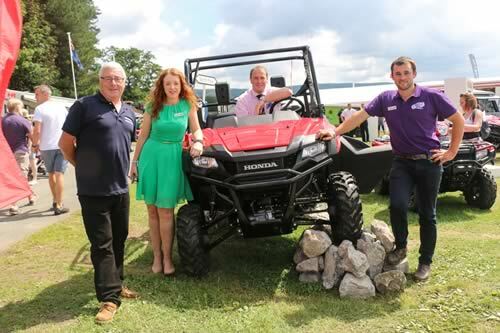 Honda representative Neil Keeble, Wales YFC Vice Chairman Laura Elliott, Wales YFC Rural Affairs Vice Chairman Dafydd Jones and NFYFC’s Chairman Ed Ford. What should be checked regularly to ensure the machine is safe. “These fun and informative sessions are aimed at educating members on ATV maintenance and safety and we’re delighted to be working with NFYFC on this project. Safety is very important to Honda and a properly maintained ATV is a step in the right direction to ensure safe usage. NFYFC has welcomed the introduction of the training courses for its members. “We are really excited to be working with Honda to offer these free ATV courses to NFYFC’s 25,000 members.